James Douglas made his thriller debut last year with The Doomsday Testament, a fine novel which pitted British art dealer Jamie Saintclair against neo-Nazis in a gripping and horrifying chase across Europe and Tibet to recover a lost Raphael painting and so much more besides. I am delighted to see Jamie, one of the most likeable and amusing heroes you could meet in such dire circumstances, back again in the follow-up novel The Isis Covenant, published this week. The Isis Covenant makes use of one of the most successful and fascinating aspects of The Doomsday Testament – parallel mysteries in the present day and in the Second World War, in this case, during the very closing days of the war, in a tortured Berlin. We’re used to nasty Nazis in thrillers but in these two novels there is much more to it than that, not least because of the brilliant descriptions of Berlin and the desperation, fear and evil that pushed these men on while the bombs fall and bullets fly around them. James Douglas is the pseudonym of one of my favourite historical writers – Douglas Jackson – and so it comes as no surprise that he can bring the history around these characters to life. The Isis Covenant focuses on the pursuit of men both good and bad to find the crown of Dido, a wonder lost to history by the Phoenicians and much later abused by Nazi treasure hunters and torturers. What complicates matters is the gap in the crown’s front. This once held the largest diamond ever seen, a legendary gem, known to some as the Eye of Isis. If the Eye and the crown are again united then its power would be revealed but only, so the villains believe, with the spilling of young and innocent blood. The pursuit of the crown and the diamond results in horrors in both 1945 and in the present day as well as in the distant past when Nero was one of the first tyrants to hunt this gift that just may hold the answer to death itself. Jamie Saintclair is still suffering from the consequences of his previous adventure, not least a price on his head. When (female) New York detective Danny Fisher offers this infamous discoverer of lost artefacts the job of helping her to solve the riddles surrounding the brutal and horrid murders of two families (both called Hartmann) on either side of the Pond, he grabs the chance to keep one step ahead of the men on his trail. Of course, they’re not the only ones. As with The Doomsday Code, there is a charismatic and utterly terrifying baddie following his own trail and savage plan towards the same goal. The paths will cross. And that’s not counting the Russians. Jamie Saintclair is as agreeable a hero as ever but this time he is partnered with an equally interesting and much more-rounded heroine – tough, brave but wary Danny. There are other intriguing characters here, some of whom are surprisingly likeable. There are several strands of story, set in the present day and in 1945, and you need your wits about you to keep all the threads untangled – just what I want in a thriller. The action moves around the countries too and I especially enjoyed the scenes set in past and present Berlin and in modern Switzerland. The descriptions are vivid, the action is taut and there is frightening brutality, offset by the appealing Jamie and Danny. All in all, this series of thrillers has great ingredients and I can’t read them fast enough. 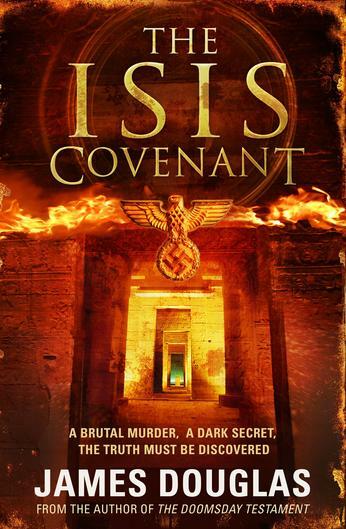 With The Isis Covenant, James Douglas – aka the wonderful Roman historical fiction writer Douglas Jackson – has built on the both impressive and enjoyable strengths of The Doomsday Testament and produced a corker of a thriller. Review of The Doomsday Testament. This entry was posted in Review, Thriller and tagged Thriller on July 30, 2012 by Kate (For Winter Nights). I have read all three of the novels of Douglas Jackson and they were excellent but I will not be reading either of the James Douglas efforts. I think that I made my opinion of this kind of thing clear in a previous reply to a review. As you appear to have some contact with Mr Jackson please use your influence with him to get him back to Rome and leave this sort of thing to the comic book hacks. Rome, Mr Jackson, that is where we need you exercising you undoubted talents ROME!!!!! Douglas Jackson is a fine writer of Roman historical fiction and thrillers. He has a gift for both and so I will be encouraging him to wear both hats as often as possible. As you haven’t read either of his thrillers, it seems a little unkind to dismiss them out of hand. I would most certainly disagree with the conception of thriller writers as ‘hacks’, some are excellent – this is obviously a genre you don’t enjoy at all so you may want to give my thriller reviews a wide berth! Jackson has written four Roman novels with the fifth (Avenger of Rome, the third in the Valerius series) published on 16 August. I’ll be adding my review of Avenger of Rome very shortly. Thanks for that Ian, I commend to you Avenger of Rome, out on August 16th, and I’ve just completed the first draft of Sword of Rome, the fourth Gaius Valerius Verrens novel, which takes him through the early struggles of the Year of the Four Emperors, and is, if I do say so myself, not bad. I write the thrillers to keep me writing and keep me fresh, as a change from the fetid aroma of the Subura, the political backstabbing both metaphorical and literal, and the relentless toil of a legion on campaign. It also helps me keep a roof over the family’s head, which, as any full time novelist will tell you, is far from guaranteed. PS If you’ve only read three you must have missed one. Please rectify immediately! Hi Doug! Having just finished Avenger of Rome I must congratulate you on another fine Roman novel. I’ll put a review up in the next day or two. I loved both Doomsday and Isis and the third Jamie Saintclair adventure can’t come soon enough for me. Just because an author excels in one genre doesn’t mean he can’t also excel in another. Certainly, it’s all good news for the reader.